Specially Engineered for Versatile Cooking : The Pigeon Favourite pressure cooker is just the thing you need if you are looking for an all-purpose cooking utensil. This Pigeon model is convenient to use and can be used for both boiling and slow cooking food. The outer lid easily fit locks and covers the food while cooking. Featuring a gasket ring with a safe release valve, you do not have to worry about any mishaps with this pressure cooker. Furthermore, with its induction base, you can use it on induction tops as well as gas stoves with equal ease. Perfect Capacity for Everyday Use : The 3 litre capacity of the Pigeon Favourite pressure cooker is perfect for small families. The cylindrical pot of the pressure cooker can double up as a cooking utensil on its own. The premium quality aluminium evenly distributes the heat and ensures that the food is cooked faster. The closed unit cooking ensures that there is less use of fuel, making it a highly efficient cookware. Easy to Clean and Maintain : The sturdy build is easy to handle and maintain. Owing to its size, it can be conveniently stored in your kitchen racks. This versatile cooking utensil is a must-have for all kitchens and will make cooking easier and faster. Featuring a capacity of 3 litres and a smart outer lid design, the Pigeon Favourite aluminium pressure cooker is an ideal cookware for small to medium families and can help cook your favourite dishes in a jiffy while retaining its taste. Its special induction base makes it compatible with both gas stove and induction cooktops, adding to its versatility. Use this pressure cooker to cook lip-smacking sabzis, dal, rice, meat and much more. 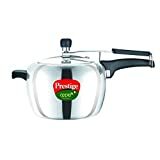 Made from high quality virgin aluminium and featuring highly ergonomic safety handles, the 3-litre Pigeon Favourite pressure cooker is built for long-lasting durability while providing excellent ease of use. This material also enables even distribution of heat, leading to faster and more efficient cooking. Featuring a gasket release system with metallic safety plug and precision weighted valve, this pressure cooker has safety at the forefront while cooking.